Hydrological processes cause variations in gravitational potential and surface deformations, both of which are detectable with ever increasing precision using space geodetic techniques. 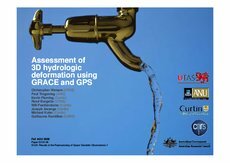 By comparing the elastic deformation computed from continental water load estimates derived from the Gravity Recovery and Climate Experiment (GRACE), with three-dimensional surface deformation derived from GPS observations, there is clear potential to better understand global to regional hydrological processes, in addition to acquiring further insight into the systematic error contributions affecting each space geodetic technique. In this study, we compare elastic deformation derived from water load estimates taken from the CNES, CSR, GFZ and JPL time variable GRACE fields. We compare these surface displacements with those derived at a global network of GPS sites that have been homogeneously reprocessed in the GAMIT/GLOBK suite. We extend our comparison to include a series of different GPS solutions, with each solution only subtly different based on the methodology used to down weight the height component in realizing site coordinates on the terrestrial reference frame. Each of the GPS solutions incorporate modeling of atmospheric loading and utilization of the VMF1 and a priori zenith hydrostatic delays derived via ray tracing through ECMWF meteorological fields. The agreement between GRACE and GPS derived deformations is not limited to the vertical component, with excellent agreement in the horizontal component across areas where large hydrologic signals occur over broad spatial scales (with correlation in horizontal components as high as 0.9). Agreement is also observed at smaller scales, including across Europe. These comparisons assist in understanding the magnitude of current error contributions within both space geodetic techniques. With the emergence of homogeneously reprocessed GPS time series spanning the GRACE mission, this technique offers one possible means of validating the amplitude and phase of quasi-periodic signals present in GPS time series.